Brazing stainless steel tubing to copper tubing with SSF-6 silver solder using a hand held propane torch. As you can see, the silver solder flows very well and finishes with no pinholes or porosity–with a strength of over 70,000 psi. Clean your parent metals well before soldering and heat until you just start to see the metal turn red and deposit your SSF-6. 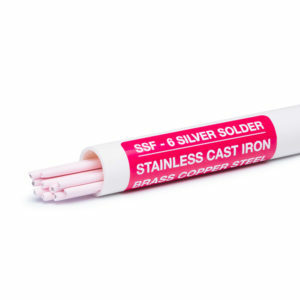 SSF-6 56% silver solder is cadmium free, food grade, pharmaceutical safe. SSF-6 also works fantastic on copper nickel or cupro nickel as used in the marine industry.